Back again just in time for the holiday season 2014. These are a clone of the See’s Candy dark chocolate caramel mallows that you can find in their stores out in California and the western United States. And just as delicious. Sold only for a few weeks around the holidays, grab a box before they’re all gone for another year! 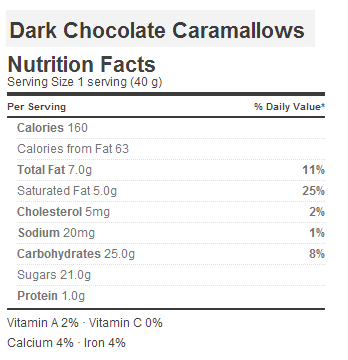 A few more thoughts, the See’s version is officially called Scotchmallows and are round not rectangular. The TJ version has a softer texture to the caramel. They’re $4.99 for a box of 10 this year, up from I believe $3.99 last year and $2.99 in 2012 but they seem to be quite a bit larger now vs last year’s version and also larger than the See’s Scotchmallows, so the extra dollar per box is a bit easier to swallow. 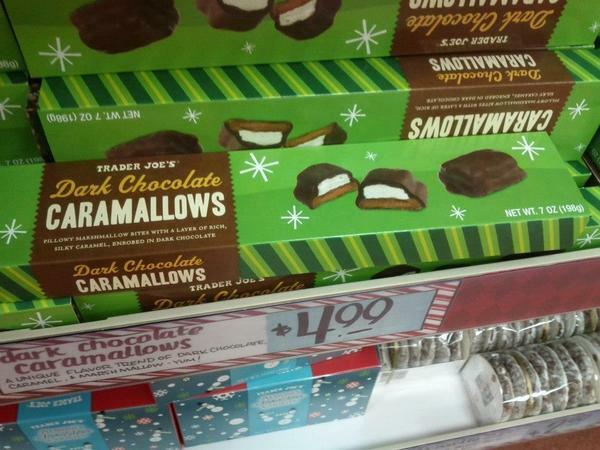 Please bring back the Trader Joe’s Dark Chocolate Caramallows!